Shirley Martha Deel Jude age 80 of Richmond, Kentucky passed away Tuesday, November 13, 2018 at the Compassionate Care Center in Richmond. Shirley was born at Russell Prater, Virginia on March 8, 1938 the daughter of the late Birtie Christopher Deel and Lilly May Boyd Deel. Along with her parents, she was preceded in death by her husband, Thomas Herbert Jude and two sisters, Betty Deel and Lucille Deel. She is survived by two sons, Thomas Jude (Jamie) of Pikeville and Avery Conly of VA and one daughter, Jennifer Cowan (David) of Richmond. 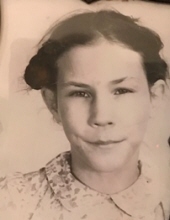 She is also survived by two brothers, Jerry Deel of Labanon, Va. and Glennis Deel of Raven, Va. and five sisters, Dorothy Wintermute of Clearwater, Fla., Helen Ramey, Conaway, Va., Etta Powers of Bee, Va., Juanita Jackson of Vansant, Va. and Arlene Stiltner of Elkhorn City, Ky. and also two grandchildren, Zachary Cowan and Kylie Grace Cowan. To send flowers or a remembrance gift to the family of Shirley Martha Deel Jude, please visit our Tribute Store. The visitation and funeral will begin at 2:00 P.M. Friday November 16, 2018, in the mausoleum chapel at Mountain View Memorial Park in Big Rock, Virginia. Burial will follow at the cemetery. "Email Address" would like to share the life celebration of Shirley Martha Deel Jude. Click on the "link" to go to share a favorite memory or leave a condolence message for the family.